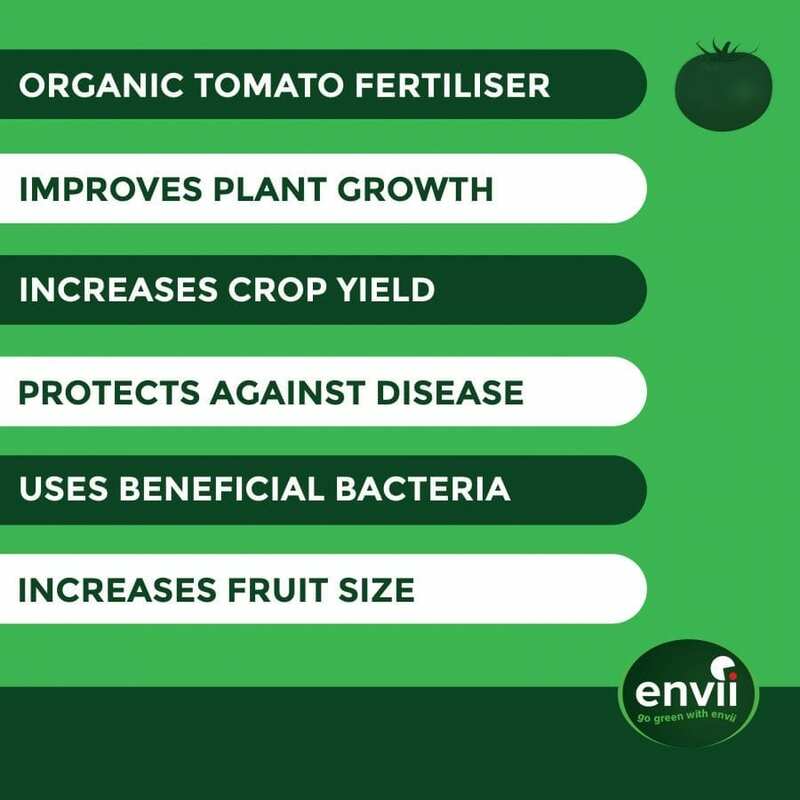 Maximato isn’t your ordinary organic tomato fertiliser. It’s a one of a kind treatment that uses an Envii staple ingredient, bacteria. The bacteria in Maximato have a very specific job; to colonise the roots, protect them and improve their nutrient uptake. One benefit of a bacterial fertiliser over a nutrient fertiliser, is that the plant can’t reject the bacteria. A plant can choose whether it absorbs nutrients, so it may choose not to absorb a nutrient fertiliser. However with Maximato, the bacteria anchor on to the plants roots and live there for the life of the plant. They work continuously to increase crop development and yield, improve plant health, and protect plants from diseases and environmental stress. When testing Maximato we found that it increased crop yield by up to 50% when tested against a seaweed fertiliser. We also found that it reduced the risk of common diseases such as blossom end rot as the bacteria could help the plant control the uptake of water and nutrients. The size and flavor of the tomatoes were also improved, a great added bonus! 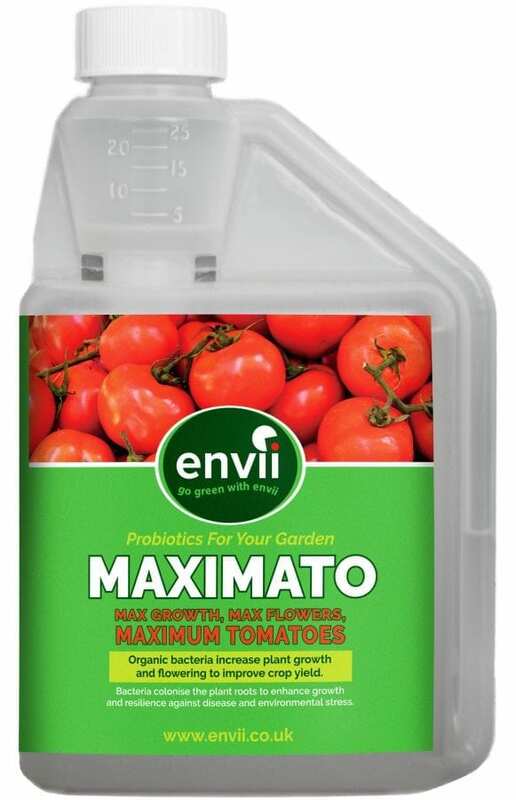 Each 500ml bottle of Maximato is enough to treat 10 tomato plants, with each plant only needing two treatments. For best results, use Maximato in conjunction with a seaweed fertiliser such as SeaFeed Xtra. The nutrients in SeaFeed will not only feed the plant but will also act as a food source for the bacteria. If you struggle with ripening your tomatoes, check out this blog post and video where we give you a great tip to help ripen your tomatoes. Apply when the first three leaves have developed. At this stage the root system is bigger for the bacteria to colonise. Yes. Maximato doesn't contain many ingredients, but the ingredients that we use are all organic. Can this be used on any other plants? Maximato can be used all fruits and vegetables but we have found that it is best suited to tomatoes and chillies. How many plants does this treat? 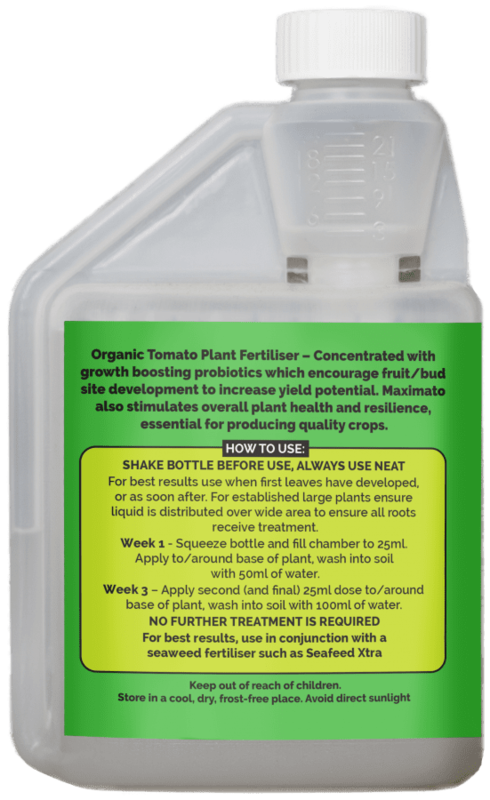 One 500ml bottle of Maximato will treat 10 tomato plants. Unique biostimulant plant fertiliser that acts as an alternative for traditional sun protection methods for plants. Protects plants from sun damage and heat stress by improving root length and allowing the plant to access more nutrients and water. A liquid biosimulant and fertiliser lawn feed that increases strength, health and appearance of your lawn. Greenkeerper’s Secret acts as a Stress Support System as well and stopping your lawn from being damaged by drought and excessive rainfall so easily.